Each 3-minute devotion will give you a spiritual boost to either help you through the day, or get you ready for the next. Daily Wisdom for Women has touched the lives of more than three quarters of a million readers since its release nearly two decades ago. 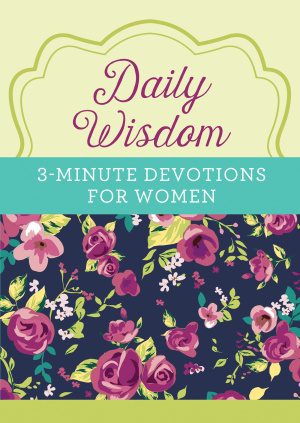 Now in a great "3-Minute Devotions" edition, this devotional will continue to encourage new generations of women as they seek the true wisdom only found in God's Word. Minute 1: scripture to meditate on; Minute 2: a short devotional reading; Minute 3: a prayer to jump-start a conversation with God. This beautiful package makes a fabulous any-occasion gift for every woman. Daily Wisdom for Women 3 Minute Devotions by Rachel St. John-Gilbert was published by Barbour in April 2016 and is our 2090th best seller. The ISBN for Daily Wisdom for Women 3 Minute Devotions is 9781634096898. Be the first to review Daily Wisdom for Women 3 Minute Devotions! Got a question? No problem! Just click here to ask us about Daily Wisdom for Women 3 Minute Devotions.